Building product manufacturers sponsor the free AIA continuing education courses on our platform. Course sponsors also include trade associations and non-profit organizations who want to promote best practices and code requirements. Course sponsors are experts in their industries and CSI divisions. Sponsored courses award free AIA HSW hours and contain real-world practical knowledge. 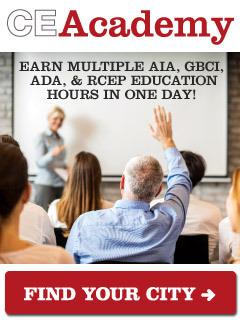 Some of the free AIA courses also award IDCEC credits. Ron Blank & Associates welcomes companies to submit their online AIA CE course for distribution, or to work with our team to develop a sponsored AIA course. "I am scheduling some classes to meet my 2017 obligations.... Thank you for making this easier for AIA members!"